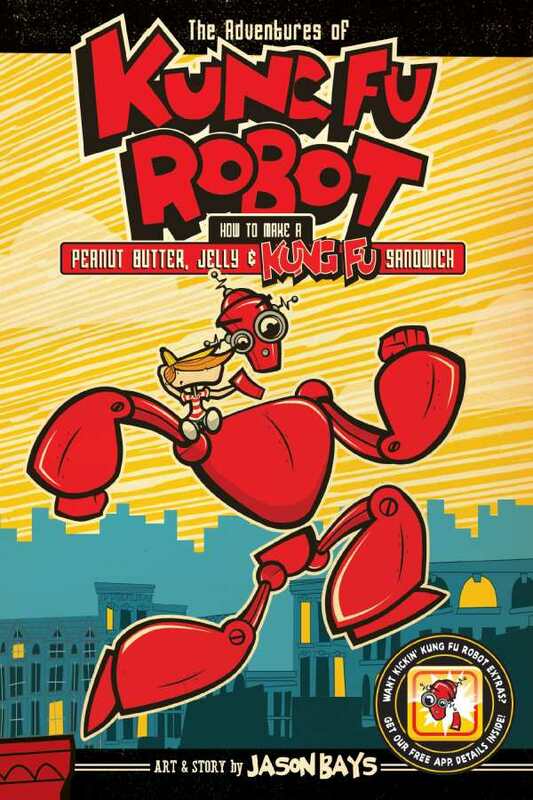 A robot who knows Kung Fu and loves peanut butter and jelly sandwiches battles a chicken who aims to, of course, steal all the peanut butter and jelly he can find, in The Adventures of Kung Fu Robot: How to Make a Peanut Butter, Jelly & Kung Fu Sandwich, by Jason Bays. If that sounds a bit wacky, it is—Kung Fu Robot began as an app that’s now been downloaded over half a million times, with games like “Whack-A-Ninja” and “Unicycle Race.” The games aren’t particularly original in their basic execution, but they’re done with great style, outstanding art, and an offbeat sense of humor, and the same can be said about the story told in the graphic novel. Kung Fu Robot and his best friend and sidekick, a nine-year-old boy named Marvin, battle against a horde of ninjas and their commander, the evil Kung Pow Chicken, who is behind a series of peanut butter and jelly thefts. The book is heavy on action, which keeps things simple and fast-moving, and also gives the opportunity to show off some augmented reality features. By downloading the free app and using the “Kung Fu Vision” feature, special add-ons, sound effects, and games can be unlocked by scanning the appropriate page in the book. The dialogue is fast-paced too, with ongoing commentary by Kung Fu Robot, including amusing little asides like “That worked out differently in my head.” Why does a robot need to eat anything, let alone PB&J sandwiches? It’s not important, because the primary goal of The Adventures of Kung Fu Robot is easily forgettable fun, which it delivers, in loads—the perfect recipe for the eight- to twelve-year-old intended audience.